Cotton prefilter: Catch large dust particles and mites, it is a washable. 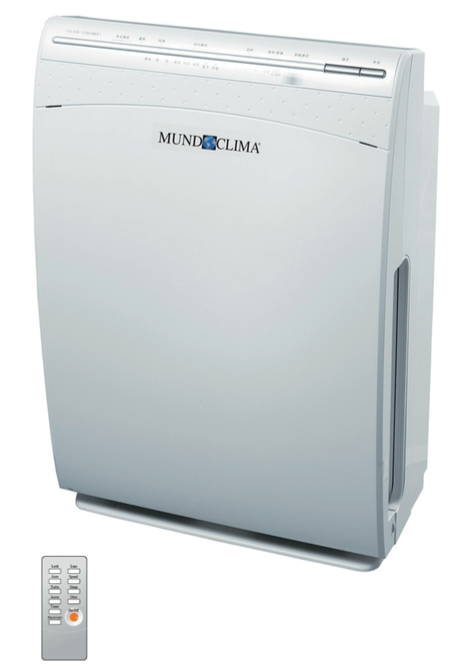 HEPA Filter: with filtration efficiency above 99% of particles larger than 0.3 µm, mainly used in clean rooms (ORs pharmacies, laboratories, etc.) It catches viruses and bacteria. HIMOP Filter: (composed of polycrystalline ceramic particles), technological innovation developed to eliminate formaldehyde. It has a catalytic capacity, it can break down and absorb hazardous substances (COV’s). Negative ion generator: “vitamins of the air” or cooling mode, the release of both makes the ambient air fresh and natural (the air surrounding forests and waterfalls is rich in negative ions). Charcoal filter active: The great porosity of the active carbon allows it to absorb harmful gases and unpleasant smells. Plasma: It releases ionic groups and eliminates a great quantity of air bacteria and tobacco smoke. LIGHT INDICATOR OF THE FILTER: it shows when the filter needs to be clean. AUTOMATIC OPERATION: it allows automatic selection of different levels to assure comfort. NIGHT OPERATION: reducing the fan speed and increasing comfort overnight. OPERATION TIMER: automatic control of timer. DISPLAY OF THE OPERATION ALARMS: it allows to know the state and indicates the need for servicing. MEMORY: in case of a power failure, the equipment will restart with the last set program.